"We Speak To You In English, Not Geek!" "We Speak To In English...Not Geek!" “We Speak To You In English, Not Geek!” – TM – Computer Repair and Network Management you can count on! JamKo Force Networks delivers business class Managed IT Services, Cloud Services and VoIP Solutions (Internet Phone Service). This is accomplished by partnerships with the world’s largest and greatest technology companies. Over 20 years of IT Experience and Computer Repair knowledge has allowed us to negotiate terms on solutions that will bring your enterprise to the next level. The track record speaks for itself. JamKo Force Networks has been in business for over 9 years. Our customers are among the most well serviced in the industry. We have the stats and testimonials to back it up. The proof is always in the pudding. JamKo is Southwest Florida’s Computer Network Support Specialist. James W. Kockler founded JamKo Force Networks in 2007. James has a career spanning 18 years working in technology and customer service for multinational corporations, as well as small businesses. The wisdom from his experience in customer service is a fundamental part of our operations philosophy. Visit our IT Blog for news and technology trends. We serve all of the Southwest Florida Gulf Coast with dependable, qualified PC & Network Management Services, Cloud Services, VoIP Phone Service and Computer Repair & Support. All of our IT Services are available to the following area’s of Southwest Florida. Our service areas include Fort Myers, Naples, Cape Coral, Bonita Springs, Marco Island, Sanibel Island, Ft. Myers Beach, Port Charlotte, Punta Gorda, and Lehigh Acres and now in Knoxville TN. One Solution to Rule Them All. We have simplified IT Management for your Business. Our Managed IT Services plan brings tremendous benefits to your Business and your staff. Gone are the days of confusing variable invoices and hard to reach tech people. We bundle all Information Technology services into one monthly invoice scaled to the current needs of your Business with easy to predict flat rates. Imagine having Unlimited 24×7 Help Desk, Unlimited IT Consulting, Network Monitoring, Anti-Virus, Patch Management, Off-Site Backup and Virtualization Services all with a specialist under one roof. JamKo Networks Managed IT is the answer to your executive technical needs of your business. VOICE OVER IP PHONE SERVICES "UNLIMITED US CALLING"
Need to add more people to your conference call? It’s as easy as pushing a couple keys on your phone without missing a beat. A feature that provides authorized users the ability to listen in on and monitor calls. Broadcast an announcement to your entire team – or just those who you’ve selected. Get an audio file sent to your email and never miss a message again. 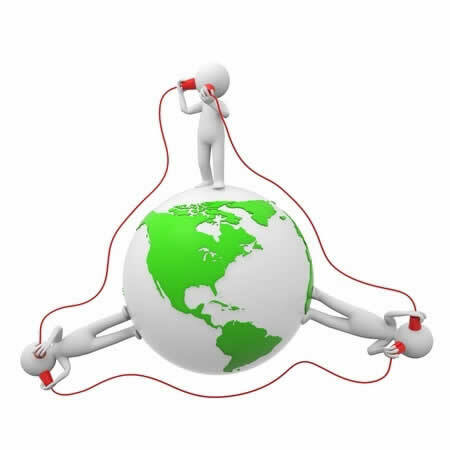 Phone extensions can be added as your company grows making this system extremely scalable to your business needs. A sophisticated auto-attendant will route your calls as you and your team need automatically. Virtual Desktop Infrastructure (VDI) is the future of business computing. We have partnered with Nerdio to deliver first class Cloud Computing Services to our customers. Whether you’re already committed to moving into the Cloud, or just looking at your options, we can help you make a smooth and victorious transition. First Class is boarding now.